Used for quick repairs of electrical components but also for many handicrafts, a soldering iron is an essential tool in a DIYer’s kit. So essential that today’s market offers a bountiful range of models for hobbyists and professionals. This means there is plenty of choice. But what specs to look for? Adjustable temperature? Multiple tips? Accessories? Don’t let these questions overwhelm you! 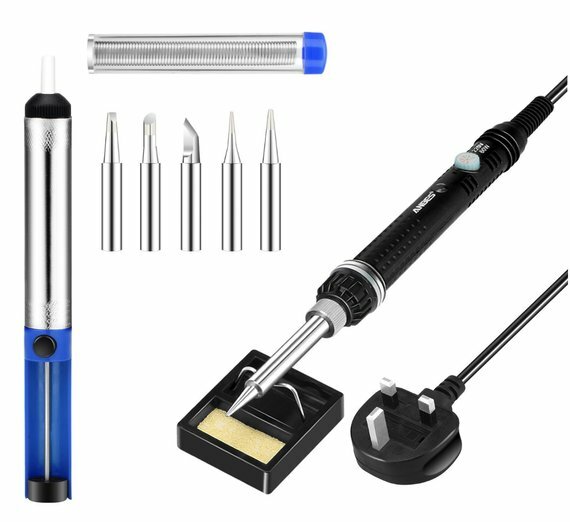 To identify the best soldering irons in the UK, our expert team has tasted and rated some of the most promising tools available. Check out our top picks below. A complete set of tools, comprising an adjustable temperature soldering iron, a pocket screwdriver and a multifunctional multimeter. Reliable and affordable, this product is ideal for occasional use. Six soldering tips are provided for added versatility. A 14-piece adjustable kit that is suitable for lighter work, but not favoured for heavy-duty soldering. Includes a soldering pump. One of the better irons we tested. Another 14 piece kit with six soldering tips and a sponge stand. Temperature can be adjusted between 200°C and 450°C. Best for those who need tool & temperature customisation. Iron has a ceramic core with four ventilation holes for rapid cool-down. Six tips included but stand is low in quality. Still good as a low-cost option. Anbes Upgraded soldering iron kit is our top pick for a reason. It is a complete set of tools for hobbyists and beginners suitable for a wide range of uses. In fact, the kit is perfect for DIY crafts including jewellery making or wood engraving. You can use it to repair household appliances and electronic devices, to design circuits or to use for classroom electrics work. The set includes a high-performance soldering iron that incorporates inner-heated ceramic technology. The soldering temperature is adjustable between 200°C and 450°C, the tip heats up in minutes and cools down in a flash. Four ventilation holes on the tip ensure a quick heat dissipation to prolong the product’s lifespan. All three soldering tips in the box are made of heat-resistant material while a screw head holds the tip in place throughout the work. A rubberised soft grip handle increases user comfort and prevents any over-heating of the product, minimising the risk of burn injuries. A standard dual spring soldering iron holder with sponge provides a reliable support for the hot tool. 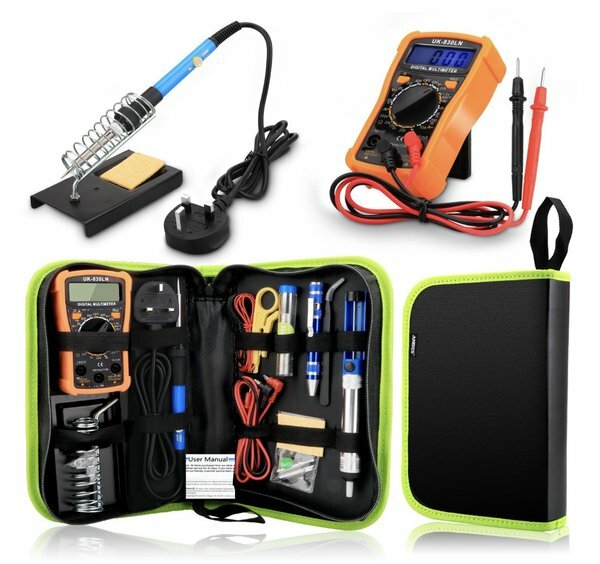 Iron apart, the kit also includes an 8-in-1 precision pocket screwdriver with magnetic bits holder and a multifunctional Multimeter with LCD display. These two tools, together with the wire stripper cutter and high-pressure de-soldering pump, make the kit perfect for DIY and professional use. The product has few flaws but the most annoying is the lack of versatility of the soldering tips. There are only three different tips in the box, one on the tool and two in a separate bag, and this is rather disappointing. Lower-end tools include more tips and we had higher expectations from this kit. This aside, this still is one of the most versatile soldering kits available on the market. Soldering iron is made of high-quality heat-resistant materials, is lightweight and easy to manoeuvre. Rubberised soft-grip handle provides comfort and protection. Standard dual spring holder with sponge provides a safe base for the hot tool, preventing injuries or damage. The versatile pocket screwdriver is made of rugged aluminium, it clips to the pocket and comes with eight quick-change bits. 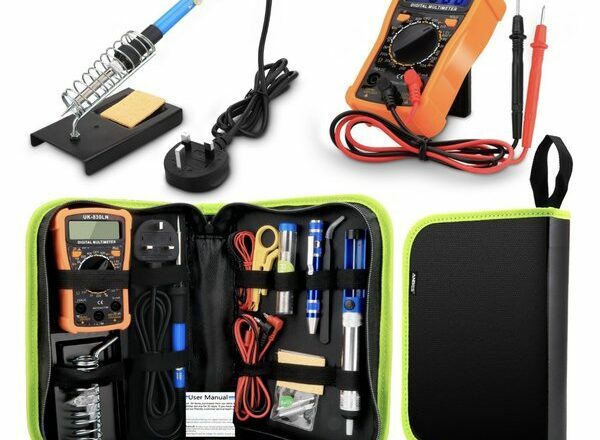 Perfect for circuit design or electronic device repair, the kit includes a Digital Multimeter for measuring DC/AC voltage and current resistance. Stylish polyurethane carry bag keeps all objects together, preventing dispersion and ensuring easy storage and transport. Although stable, the soldering iron holder looks flimsy and occupies a lot of space on the workbench. Something to bear in mind if you work in a restricted area. The sponge in the kit is very thin; we recommend replacing it with a better quality one. Customer service, although friendly, is not overly helpful. Intey is a low-cost soldering kit ideal for DIY enthusiasts comprising decent quality tools and accessories. 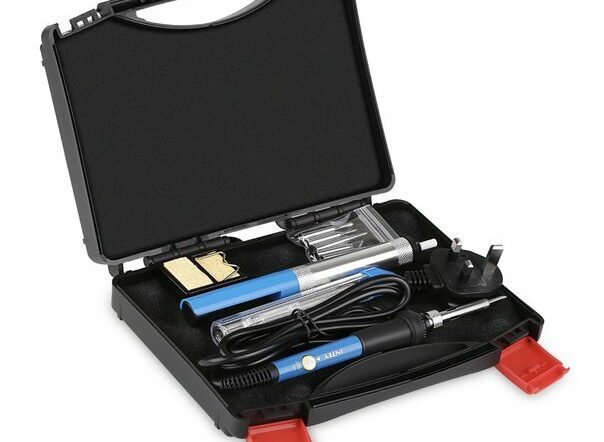 The kit is suitable for a wide range of soldering works and is ideal for occasional use. The kit contains a soldering iron and six soldering tips, an iron stand, a de-soldering pump, and solder wire. A rigid carry box with handle houses the units of the kit, keeping the tools and accessories together. Two heavy-duty latches on the sides of the box close it securely for transport and storage. The soldering iron is equipped with an upgraded ceramic micro-heater chip that heats up in about two minutes, while three heat emission holes ensure optimal heat dissipation and a quick cool down, extending the product’s lifespan. A soft-grip handle ensures a comfortable manoeuvring of the iron and provides optimal heat insulation. Thanks to this feature, it is possible to keep the soldering iron on for a longer time. Additional tools and accessories improve the user experience and increase the product’s versatility. Different soldering tips make the kit suitable for a wide range of applications, while a powerful de-soldering pump removes excess solder in a breeze. A fairly stable stand keeps the hot iron fixed firmly. Reliable and portable soldering iron made of environmentally friendly materials. It is lightweight and easy to handle. Soft-grip design reduces slippage and increases comfort during use. The handle is heat-insulated to prevent burns. Soldering iron stand with a cleaning sponge offers a reliable support for the hot iron and allows an easy cleaning of the tip. Ceramic micro-heater chip heats the product in less than two minutes; three heat dissipation holes ensure a quick cool down. Adjustable temperature ranges between 200°C and 450°C; the product is suitable for different soldering works. The tool doesn’t have an LED indicator that shows when it has reached set temperature. YTE 60W is a temperature-adjustable soldering iron designed with the enthusiast DIYer in mind. The product is functional, easy to use, and portable; it comes with six soldering tips for welding or soldering appliances, jewellery, circuit boards and more. The heat and impact resistant design is an important quality of the unit. 60 watts provide sufficient power for most applications, a screw head secures the soldering tips in place during work, and adjustable temperatures add versatility. Temperature ranges from 200°C to 450°C and an LED indicator lights up when the desired temperature is reached. The iron also heats fast and cools down quickly. 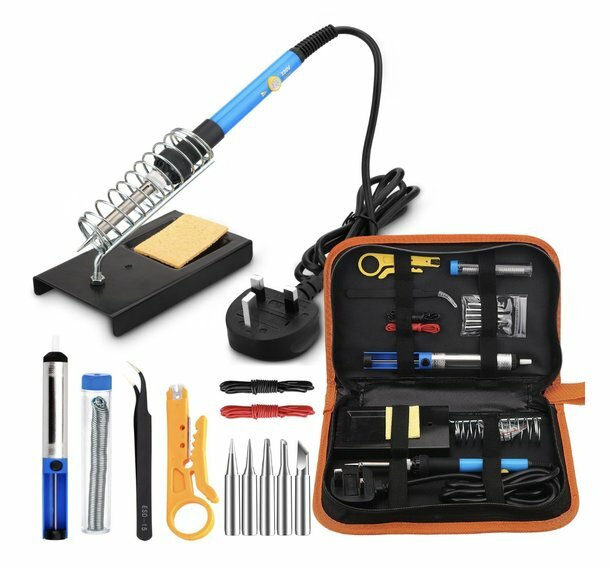 In addition to the soldering iron, the kit comprises another thirteen valuable pieces, including a de-soldering pump, a tin wire tube, a soldering iron stand and several tools such as tweezers, a wire stripper cutter and multiple soldering tips. The tool we like best is the soldering pump. It boasts a rugged metal construction and an aluminium frame. It is easy to handle and powerful enough to remove excess or old solder from PCBs joints. Another valuable item in the kit is the standard dual spring soldering iron holder. It comprises a solid metal base that incorporates the iron’s support and a sponge. This convenient design allows cleaning of the soldering tip, minimising the risk of burn injuries, although the holder’s stability is not the best. 14-piece soldering kit includes all soldering tools needed by hobbyists and beginners. It comes with a convenient carry bag which measures 27x15x4cm. Suitable for a wide range of applications, the product comes with six soldering tips and boasts an adjustable temperature dial. Iron’s screw head keeps the tip in place to avoid a drop-off. Standard dual spring holder offers a secure support for the hot tool. Soldering tip is easy to clean with the included sponge. Fast heat dissipation holes on tips and a heat-insulated anti-scalding body minimise the risk of burn injuries. Lifetime full refund warranty guarantees the product’s quality. Customers can also enjoy a friendly 24-hour customer service via email for 30 days. Soldering tips are rather small and coating on them seems to wear out quickly. The tool is more suitable for light duty work. Soldering iron holder doesn’t have an exceptional stability. Magento 14 Piece is an all-inclusive soldering kit for home use. 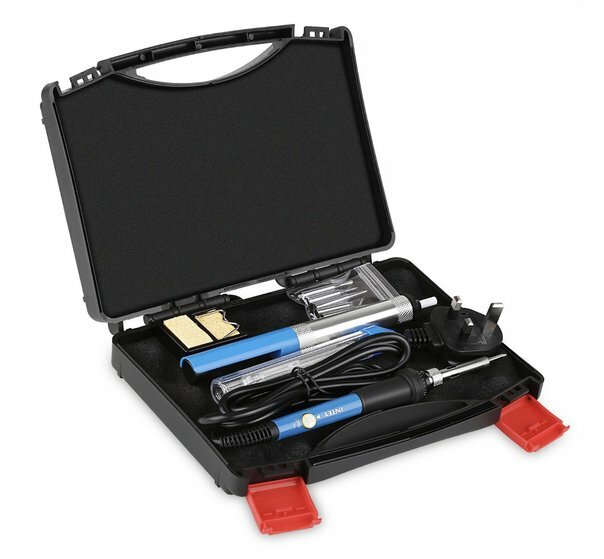 It comprises an array of tools and accessories including a soldering iron, solder wire, a de-soldering sucker pump, an assortment of soldering tips and a self-cleaning sponge stand. Patented ceramic-core induction technology provides almost instant heat, while the tool is fully adjustable. The working voltage varies from 200V to 230V while the adjustable temperature ranges between 200°C and 450°C. Six soldering tips, one on the tool and five extra, add versatility to the kit. The soldering iron has a soft-grip handle and is lightweight. Sought-after safety measures include large venting holes on the tips. A durable heating element also incorporates an advanced heat dissipation technology that cools down the iron in a flash, minimising burning hazards and prolonging the product’s lifespan. An accompanying carry case provides the perfect storage and transport solution for the soldering iron and its accessories. The case is compact, it fits in a backpack and in most drawers. Versatile and dependable soldering iron with adjustable temperature and working voltage. Perfect for multiple applications. Certified by CE, FCC, and ROHS, the product is made of high-quality and environmentally friendly materials. It is free of toxic or polluting elements such as lead. Compact carry case provides the perfect way to transport and store all the components of the kit. Patented ceramic core induction technology guarantees fast heating of the soldering element; advanced heat dissipation technology cools down the tool in a flash. 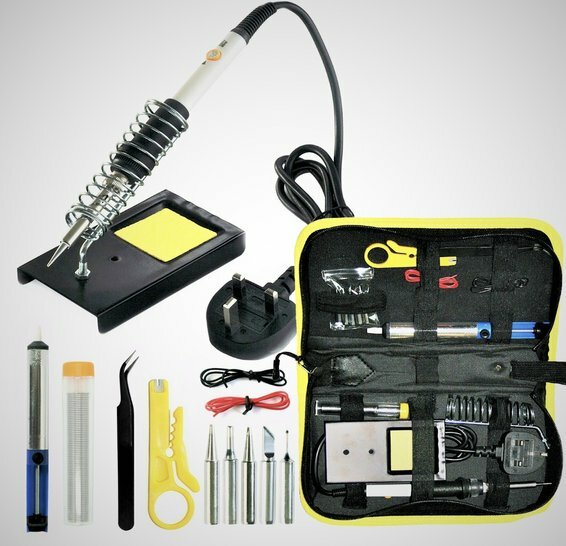 All-inclusive kit contains multiple soldering tools and accessories. Instructions are disappointing. Poorly written and missing details on how to operate the tools or use the accessories. The handle gets hot even on the lower heat settings. Unsuitable for prolonged use. Soldering iron holder has a poor design and stability. The tip can protrude out the bottom and become a burn or fire hazard. At first glance, Anbes 60W 220V is similar to the other soldering irons we tested, but there are important differences between this product and the others. Like the other units, this soldering iron has an advanced inner-heated ceramic core that heats fast, while four ventilation holes dissipate heat easily, extending the service run time. Another similarity is the easy to set adjustable temperature that ranges from 200°C to 450°C. The product has a lightweight and ergonomic design while the material connecting the soldering element to the body is temperature-resistant. This means it won’t melt during use and will not heat excessively, ensuring a comfortable and safe handling of the tool. Six tips of different sizes and shapes and made of anti-oxidation iron make the tool an ideal fit for a wide range of applications. The soldering iron comes with a soldering iron holder and other accessories. A slight drawback of the set is the holder. On a positive note, at least there is one included in the box, although its quality leaves a lot to be desired. The stand has a simple structure, and it is easier to use than a standard dual spring holder. However, it has poor stability and the hot iron can easily slide off. An assortment of soldering tips adds versatility to the product. The box includes six tips of different shapes and sizes. We like the practical, portable and safe design. The iron is lightweight and convenient to use indoors and outdoors. Anti-oxidation material prolongs the product’s lifespan. Advanced inner-heated ceramic core and four ventilation holes ensure a quick heat and cool down, extending the iron’s lifespan. Set includes a soldering iron with tip, a soldering holder, a tube of 1mm tin wire, five additional tips and a de-soldering pump. A carry case would have been a nice addition to this set. The items are hard to keep together. Soldering iron holder is small, unstable and pretty much useless. A soldering iron is a hand tool used to supply so-called “cold” heat to parts that need to be joined. The iron bonds the parts together with solder, an alloy material made of iron-free metals. Solder’s melting point varies from 180°C to 230°C, a characteristic that explains the adjustable temperature feature present on most soldering irons. This versatile tool is suitable for a wide range of applications, from electronics and household repairs to DIY crafts. From jewellery making to the creation of musical instruments, a soldering iron is used in a wide range of creative projects. In jewellery making, for instance, a soldering iron is used for both welding metals or joining parts together with silver solder. Most jewellers prefer soldering irons over other tools because of their lightweight design and easy manoeuvrability. When used with a thin soldering tip, this tool works wonders for wood engraving projects. These projects don’t require the use of solder and the slim design of the instrument makes it easy to follow intricate designs or artistic fonts. Lead-free solder and a soldering iron with a thin tip are also used in the artisanal manufacture of stained glass. Creating an artwork is simple as long as you draw the pattern on the glass and melt the solder along the lines. For a successful end-result, only stain the glass after the solder has cooled down. Mosaic sculptures are easy to craft in a similar way. Many homeowners find a soldering iron useful for a bunch of household applications, from fixing appliances to plumbing. To fix an appliance, pay attention to selecting the right solder, as not all materials are suitable to join the ends of a broken wire or circuit. Other than that, the process is straightforward. Things are more complicated with plumbing. Solder can fix copper pipes and make watertight joints, but before getting your hands dirty, make sure you learn how to seal the tubes with this method. It is essential to apply solder to clean and sharply cut joints. Clean both the outer and inner part of the tube with a wire brush before soldering. Never melt solder with the soldering iron on the joints as the excess material can clog the tube. Heat the joint with the soldering iron by “rubbing” the tool on the pipe. When the pipe is hot, bring the solder to the melting point by placing the end of the wire on the hot tube. Apply a small quantity of solder at a time and pay attention to close all gaps. Avoid overfeeding solder because excess material can clog the tube. As the solder hardens, it forms a solid seal on the joints. Before soldering copper pipes, shut off the main water supply and make sure any flammable material is out of the reach. Whether you’re interested in designing permanent circuit boards or just like to repair broken devices in your spare time, a soldering iron is an essential tool. It is used to establish, or re-establish electrical continuity between the parts of a circuit, by connecting two or more wires. For the best results, keep the surfaces clean at all times – as dust, dirt, corrosion, or debris can interrupt the circuit’s continuity. A soldering iron does a simple job, it transfers heat to things like wires, pipes, or other objects to which a solder is then applied. If you’re not familiar with this tool, here’s a step-by-step guide on how to use it. Before starting, remember that a soldering iron poses a burning hazard. Wear protective equipment including goggles and gloves, avoid wearing loose clothes and keep long hair tight. If the solder contains lead, work in a well-ventilated area and wash your hands after handling. Whether you’re soldering a circuit or a water pipe, it is essential to clean the surface of the component. Solder won’t adhere to oily, greasy, or oxidised surfaces. Dirt and dust can also interfere with the process. Make sure the surfaces are immaculate before starting. Heat the soldering iron to a temperature higher than the melting temperature of the solder. If you’re welding metals, the iron should be hotter than the melting temperature of the materials you’re working with. Most soldering irons have adjustable temperature settings and most metals and solders melt at temperatures between 180°C and 320°C. The soldering tip also has to shine before starting. Common practice is to clean it with a wet sponge when the tool is hot. Most soldering iron kits come with a sponge, or you can use a soft dish sponge for the purpose. Continue to clean the tip throughout the soldering process to remove excess solder and any random debris that might end up on the tip. One common mistake many beginners make is applying direct heat on the solder rather than on the component. This could melt too much solder and damage the piece or ruin your artwork. To avoid this, apply heat to the component. Just touch the piece with the hot tip and wait for two seconds before introducing the solder. Two seconds after heating the component, introduce the solder by touching the hot component with the end of the wire. Heat will melt the wire; liquid metal will then flow and seal the joint. This is the practice to follow regardless of the application. Remove the solder and soldering iron with caution. Allow the joint to cool down before moving the workpiece.